Is investing in leveraged funds of Direxion Daily 20+ Year Treasury Shares ETFs good for your brokerage account? Will you invest in bull or bear leveraged exchange traded funds (ETFs)? ETF investment is replacing mutual fund investment. There is variety of ETF funds offered by fund providers such as Vanguard, iShares, State Street, Fidelity, Direxion, Proshares, Charles Schwab, etc. Each provider may provide unique exchange traded funds. Some provide low cost index funds, some provide sector ETF funds, there are also leveraged funds, and more. Treasuries – Prepared for the bear? Get started today. Call 866.476.7523 or go to direxionfunds.comdirexionshares – Think direction. Trade. Investor should consider the investment objectives, risks, charges, and expense of Direxion Shares carefully before investing. The prospectus and summary prospectus contains this and other information about Direxion Shares. To obtain a prospectus please visit www.direxionfunds.com/regulatory-documents. The prospectus and summary prospectus should be read carefully before investing. This Direxion Daily 20+ Year Treasury Bear 1x Shares ETF fund objective is to seek daily investment results, before fees and expense, of 100% of the inverse (or opposite) of the performance of the NYSE 20 Year Plus Treasury Bond Index. It was first introduced to public in March 2011 and it has no rating from Morningstar yet. The fund has total net assets of $8.87 million. The annual expense ratio is 0.68%. It is currently traded at premium 0.07% of its NAV. The YTD return is 11.87%. The fund has 1-year annualized return of 13.55%. The CUSIP is 25459Y405. The index fund duration is -16.73%. 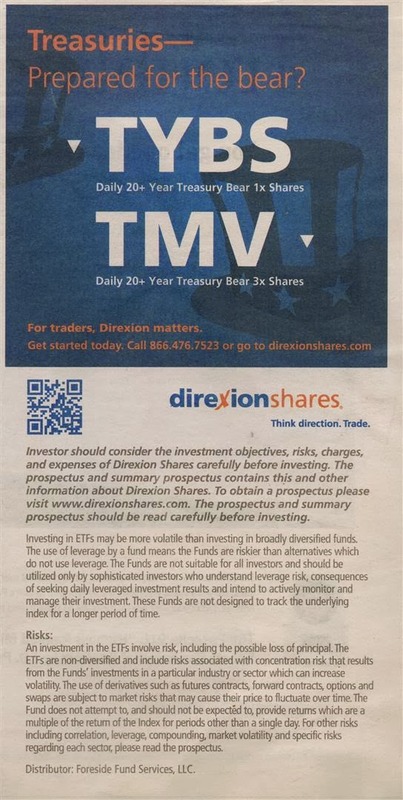 The Direxion Daily 20+ Year Treasury Bear 3x Shares ETF fund is the leveraged fund that try to replicate 300% of the inverse of the performance of the NYSE 20 Year Plus Treasury Bond Index (AXTWEN). The fund CUSIP for TMV is 25459Y678. Even though there is no guarantee the fund will meet its stated investment objective. It is currently traded at 0.10% premium from its NAV. This TMV fund was returned -6.67% in 2012. The YTD return is 11.87% and it also has 1-year total returned of 13.55%. The fund is in the 29th rank among its peers in the Trading-Inverse Debt category. The Direxion Daily 20+ Year Treasury Bear 3x Shares ETF fund is not suitable for long term investment accounts. TYBS probably can be used for short term bet. If you think interest rate will hike (i.e. treasury price will drop), you can use this Direxion Daily 20+ Year Treasury Bear 1x Shares ETF as a hedge. Use the leveraged ETFs for short term trading i.e. few hours to 1 day at most.